India has a long history of migration. More than a century ago, large numbers of Indian migrants – many of them involuntary ones – moved to Africa, the Caribbean and within the Indian subcontinent itself. 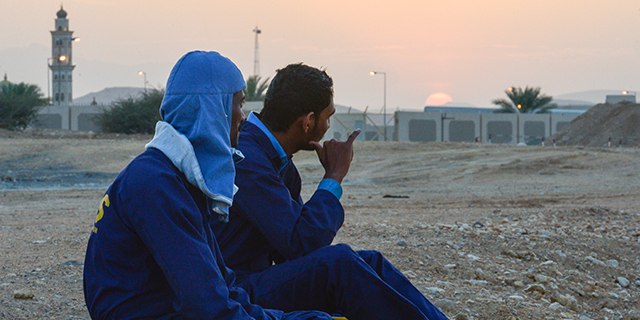 Some of the top destinations of Indian migrants in more recent decades include Persian Gulf countries, North America and Europe. Here are five facts about India and migration. 1India is the top source of international migrants, with one-in-twenty migrants worldwide born in India. As of 2015, 15.6 million people born in India were living in other countries. India has been among the world’s top origin countries of migrants since the United Nations started tracking migrant origins in 1990. The number of international Indian migrants has more than doubled over the past 25 years, growing about twice as fast as the world’s total migrant population. 2India is also one of the world’s top destinations for international migrants. As of 2015, about 5.2 million immigrants live in India, making it the 12th-largest immigrant population in the world. The overwhelming majority of India’s immigrants are from neighboring countries such as Bangladesh (3.2 million), Pakistan (1.1 million), Nepal (540,000) and Sri Lanka (160,000). 3Even though the country is the top source of the world’s migrants in total numbers, India has one of the world’s lowest emigration rates. Only about 1% of India’s birth population lives outside of the country, a similar emigration rate to that of the U.S. At more than 1 billion, India’s population is the second-largest in the world behind China. Consequently, it would take tens of millions more people to leave India before its emigration rate reached the world’s 3% average. 4India receives more remittances from migrants than any other country. About $69 billion was sent by Indian migrants to family and friends in India in 2015, amounting to roughly 3% of the country’s gross domestic product, according to the World Bank estimates. Most of the money comes from Indians living in Persian Gulf countries as well as the U.S., the UK and Canada. 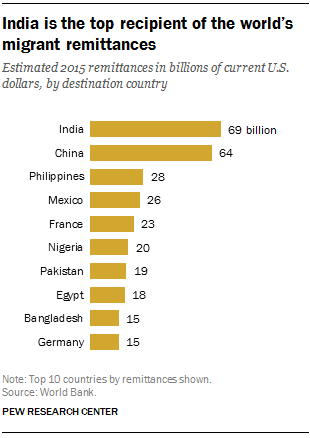 India has been the world’s top recipient of migrant remittances since 2008, when it overtook China on this measure. 5 India’s religious minorities have been more likely to migrate internationally. Religious minorities make up a larger share of India’s international migrant population than they do among the nation’s domestic population, according to 2010 Pew Research Center estimates. For example, about 19% of the Indian international migrant population was Christian, compared with only 3% of the population in India. Similarly, an estimated 27% of the Indian international migrant population was Muslim, compared with 14% of the population in India. The reverse is true for Hindus: Only 45% of India’s international migrant population was Hindu, compared with 80% of the population in India.